Deputy Speaker and Member for Lismore, The Hon Thomas George MP today launched Screenworks’ new career leveraging program Inside the Writers Room at Southern Cross University in Lismore. Applications for the program are now open with local writers being encouraged to apply for the opportunity to be placed inside the writing room of one of Australia’s major screen production companies. Screenworks has partnered with three major production companies to give three local writers the opportunity to join with their professional writers as they work and develop a story into a television script. The successful participants will be placed with Playmaker Media (The Code, House Husbands Love Child), Matchbox Pictures (Old School, Nowhere Boys, The Slap) or Channel 7’s Home and Away. To apply for the program, applicants need to be a resident of NSW and have an up-to-date Screenworks membership. Applicants are asked to demonstrate their writing ability by submitting an example of their writing for television. Three successful participants will be selected by an assessment panel of screen industry professionals. The successful participants will have their travel costs, accommodation and per diems covered as part of the program. The participants will be required to present back on what they learnt as part of the program experience, to screen writers and practitioners of the Northern Rivers. Sara Richarson, Development Manager at Playmaker media explained that “Playmaker is very happy to be supporting emerging writers in regional Australia and is looking forward to partnering with Screenworks on their forthcoming initiative”. 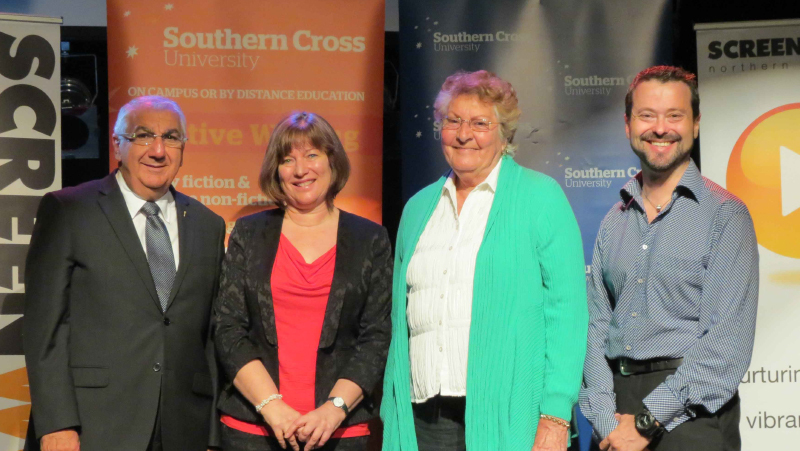 Inside the Writers Room was launched in partnership with Southern Cross University. The course coordinator for the Bachelor of Media at Southern Cross University, Dr Grayson Cooke said “Screenworks is a vital organisation for the screen industry in the Northern Rivers, and the Inside the Writers Room program is a great opportunity for writers in this region. Details of Inside the Writers Room, application forms and how to apply can be found on Screenworks’ website. Applications close on Nov 12. As the peak body for the Northern Rivers Screen Industry, Screenworks provides ongoing support to members by way of delivering an annual program of professional development events, develops local screen culture through regional premiere screenings and attracts local production to the region to help increase screen-related jobs in the region. Inside the Writers Room was made possible with the support of the State Government and funding from Screen NSW. Pictured above: The Hon. Thomas George MP, Southern Cross Universities Head of school of Arts and Social Sciences Barbara Rugendyke, Bundjalung Elder Irene Harrington, Screenworks General Manager Ken Crouch.